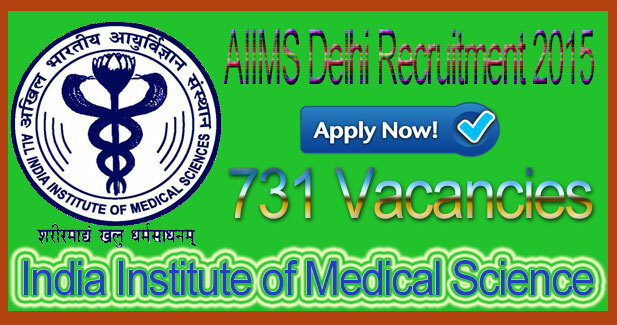 AIIMS (All India Institute of Medical Science) recently issued a notification for the recruitment in the year 2015. AIIMS is going to recruit total 731 numbers of posts in the year 2015. Good news for the entire medical stream students those who are looking to get a job in the AIIMS. Online application form for these posts starts from dated May 16th 2015. AIIMS this time going to recruit various Groups A / B / C (Non – Faculty) Posts in the year 2015. Interested and eligible students can start applying for these posts from May 16th 2015 on the main web portal for the AIIMS recruitment 2015. If you are interested & eligible for these various Groups A / B / C (Non – Faculty) Posts for AIIMS, Delhi recruitment 2015 then apply online before June 16th 2015. Number of available posts: 731 Posts. Name of the post: various Groups A / B / C (Non – Faculty) Posts. Current status: issued recruitment for 731 Posts for AIIMS Delhi. Age limit for the AIIMS Delhi recruitment 2015 is also different by each post. So here we are giving you full details of the age by each Post. Blood Transfusion OfficerSenior BiochemistAssistant Blood Transfusion Officer 30 years old. Store Keeper (Drugs) 25 years old. Education qualification for the post of Groups A / B / C (Non – Faculty) Posts candidates must have possessed Bachelors / Masters Degree or Diploma for all the vacancies from a recognized university for AIIMS Delhi recruitment 2015. Candidates firstly have to visit the main website of the AIIMS institution to apply online. Now find the suitable job link on the home page. There you will find the Registration/ Login section. Fill the application form very carefully and also upload an image (if required). After that you have to click on the submit button. Take a print out of it for further references. Thanks for visiting our site to know more about AIIMS recruitment 2015, AIIMS vacancy 2015. You have to just visit postalert.in website portal for more news and updates.